Long-time manager Barry Rosenfield describes the Corner Café and Brewery as a hidden gem tucked away in the heart of Tequesta. 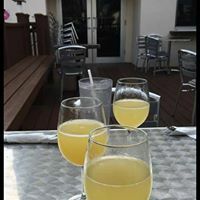 Located at the SE Corner of US Highway 1 and Tequesta Drive, the Corner Café & Brewery has been a favorite breakfast, lunch, and dinner spot for nearly 14 years. 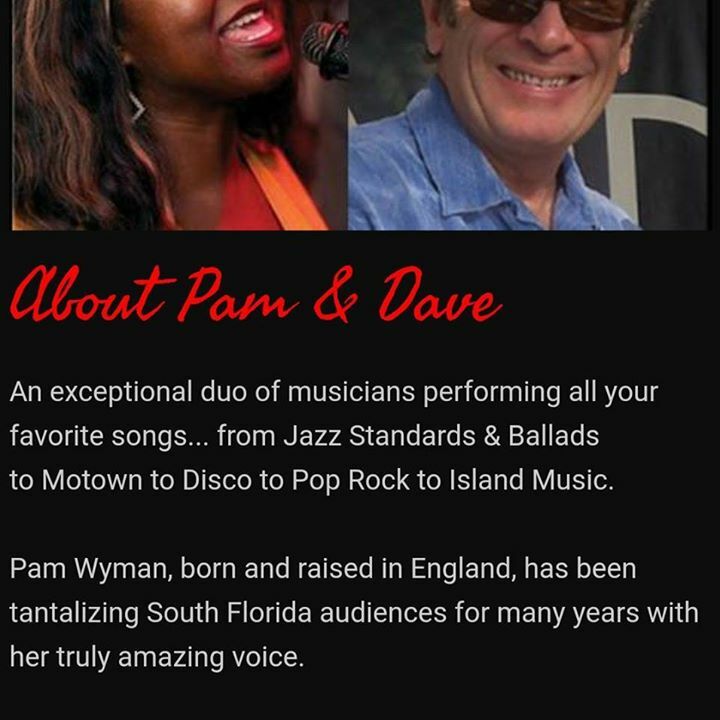 The Corner Café and Brewery also features specialty craft beers from around the world and patrons enjoy live entertainment on Friday and Saturday evenings and “Open Mic” on Tuesday night. Avocado Grill in Palm Beach Gardens – nicknamed “AG2”-- is located on the first level of the bustling Downtown at the Gardens shopping center. Inspired by the sun and sea that is Chef Julien Gremaud’s St. Tropez heritage, Avocado Grill is a celebration of South Florida’s local, vibrant flavors. Each day’s menu offers a new world of possibilities created from ultra-seasonal ingredients that become imaginative culinary experiences. 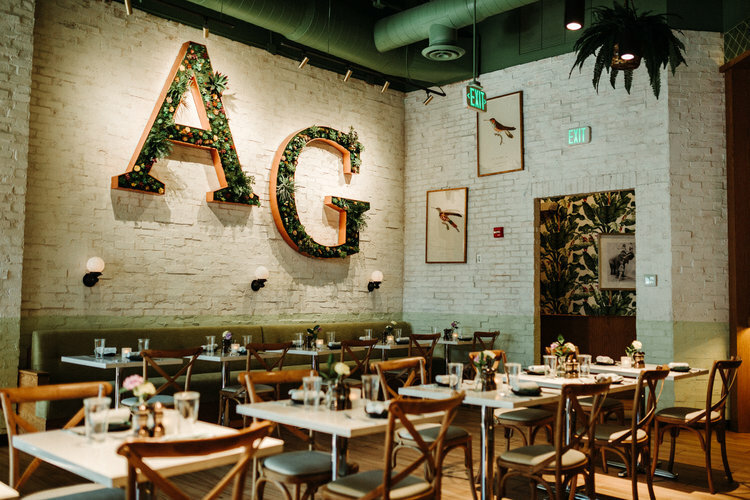 The new Avocado Grill concept at Downtown at the Gardens is Palm Beach Gardens’ newest hotspot. 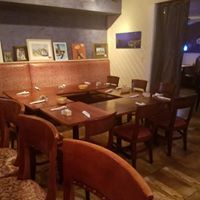 They are the spot for people who love artisanal small plates, a coastal-fresh raw bar and creative craft cocktails served in a relaxed and friendly vibe. Their artisanal menu features locally sourced, hand-picked ingredients, serving farm-to-table fare. - Half price appetizer menu TBD. Ride about 9 miles @ 8-10 mph. 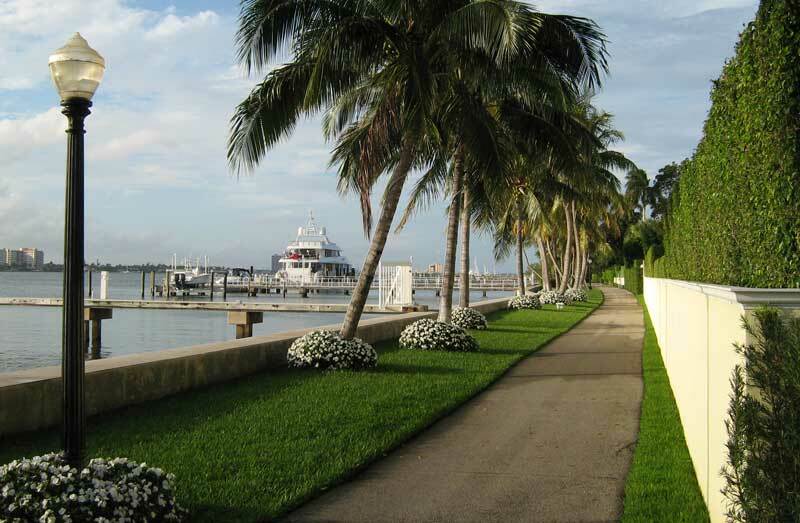 I don’t know how the millionaires in Palm Beach ever permitted it, but instead of having their magnificent properties extend out to their private docks on the Intracoastal, for six miles, there is a lovely paved bike path that interrupts their backyards. The Lake Trail in Palm Beach provides traffic-free bicycling with postcard-like scenery, a few historic buildings and glimpses into those exclusive backyards and their mansions. Meet @ Sunset Ave on Palm Beach. Go across Royal Poinciana Bridge ( North bridge) make first left at traffic light onto Bradley Place then left on Sunset Ave. Bring quarters in case you have to park in a metered area as limited free parking on Sunset. 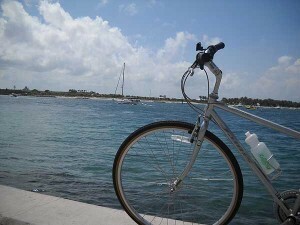 Option: Lunch afterwards @ Too Jays Deli 313 Royal Poinciana Way Palm Beach... Join us for lunch if not biking. Info or ?? Ben e-mail bbsdob525@aol.com Phone: 561-775-3481 (not a cell phone). All members in good standing are invited. Minutes from the meetings once approved are available to members upon request to the Secretary. Located in Juno Beach at the SE corner of Donald Ross Road and US 1. 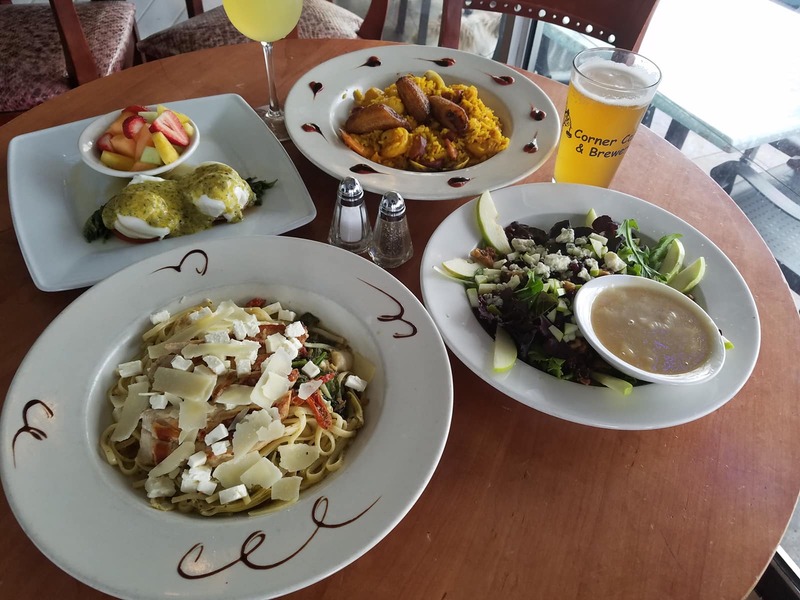 The Thirsty Turtle is a family restaurant that caters to both local and seasonal guests, serving only the freshest fish and the best wings in South Florida! Some of their amenities include: over a dozen 60"TV's, indoor and outdoor bars, fresh food with a large variety of menu items, sports room with a 110" screen along with a wall of 60" TV's. All members in good standing and their guests, as well as non-members interested in joining our Club, are cordially invited. More social time 8 pm - ???? Cash bar as usual. Happy hour prices until 7:00 pm. Don't forget to tip! We meet in the conference room upstairs from the La Fontana Restaurant. La Fontana is an Italian restaurant with a Mediterranean twist. Click here to link to the La Fontana Restaurant website. Download/print the La Fontana dinner menu. 2 for 1 Drinks all night long! A 20% gratuity will be added to your check, so no tipping is necessary. High Tops at back bar will be reserved for Gator members. 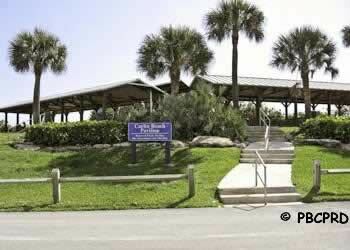 Let's have a picnic by the beautiful Jupiter Beach at the Carlin Park Beach Pavilion. Renew your membership for the year (bring your checkbook) and cross one thing off your to-do list. Enjoy the hot dogs, side dishes and refreshments cooked and served by your Board Members. Participate in fun games. Feel free to invite friends that may be interested in joining the club. Anyone interested in checking out the club is welcome. 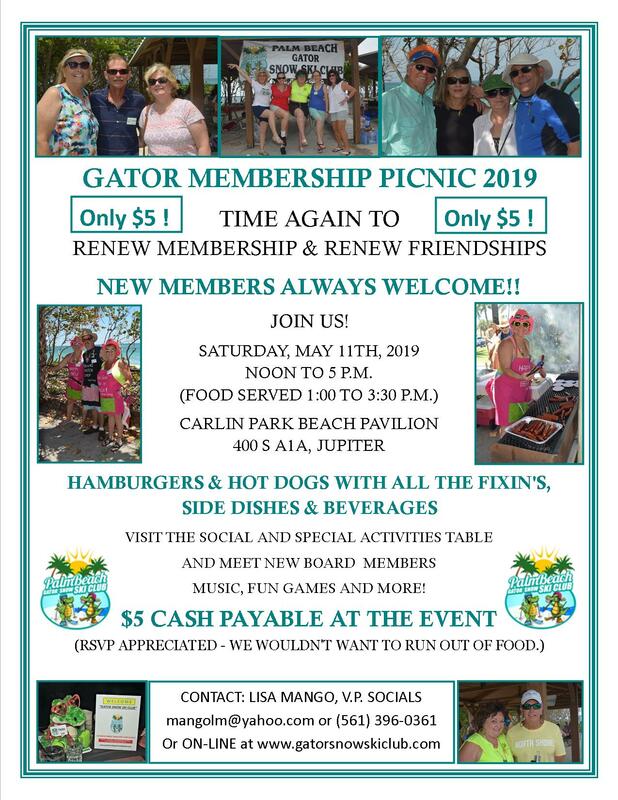 Please register on-line or contact Lisa Mango at mangolm@yahoo.com or (561) 396-0361. We would like to get a headcount for food and beverages. The membership picnic is hosted by the outgoing and incoming Board Members. Any member wanting to volunteer to help, please contact Lisa Mango. *Per person/double occupancy. Price shown reflects a 3% cash discount when paying with cash or check. Prices and conditions are subject to change; based on an exchange rate of 1 Euro=1.17 Dollars. Or, download and print the hardcopy Trip Application and mail to the Trip Leader. 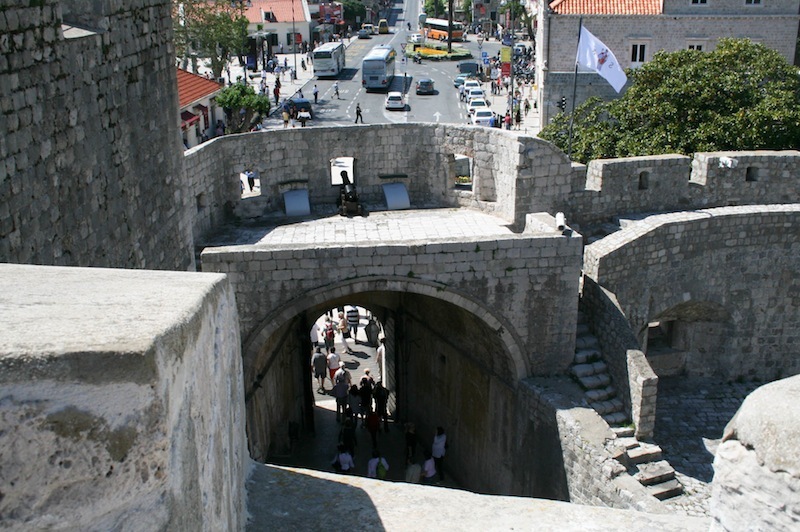 For more information, see the trip page. You must be a current member to make a reservation. To become a member or renew, click here. Each member of a family must complete a separate reservation. If paying by check, reservation is $500; make it payable to Gator Snow Ski Club and mail to your Trip Leader. Cancellation fee for your registration is a minimum of $100 unless you are transferring to another Gator trip, not previously signed up for. See the complete rules and regulations on trips. A wine-driven dining experience, inspired by Napa Valley’s Wine Country. Founded in 2005 by CEO Tim McEnery, Cooper’s Hawk Winery & Restaurants is built upon the passionate belief that food and wine hold the power to forge lasting connections. At Cooper’s Hawk, we understand that great wines begin in the vineyard. We travel the globe looking for the very best grapes and when we are particularly impressed – whether it be in Chile, France, California or Washington – we work with the wine grower to begin crafting our wine. Our winemaker nurtures each wine according to its individual needs to craft the best wine possible. It’s this philosophy that has led to hundreds of national and international awards for our collection. Cooper’s Hawk has created a modern, casual dining experience with warm hospitality in an inviting upscale setting. Our culinary team has designed a contemporary American menu infused with flavors from around the world. Each dish is made fresh in our scratch kitchen, incorporating peak-of-season ingredients, and listed with a bin number to guide you to your selection’s perfect wine match. Our Tasting Rooms embrace the rich experience of Napa, providing guests the opportunity to explore and expand their palates and enrich their wine journey. High end decanters, wine accessories, and gifts, along with our very own gourmet food line, allow guests to live the Cooper’s Hawk lifestyle at home. 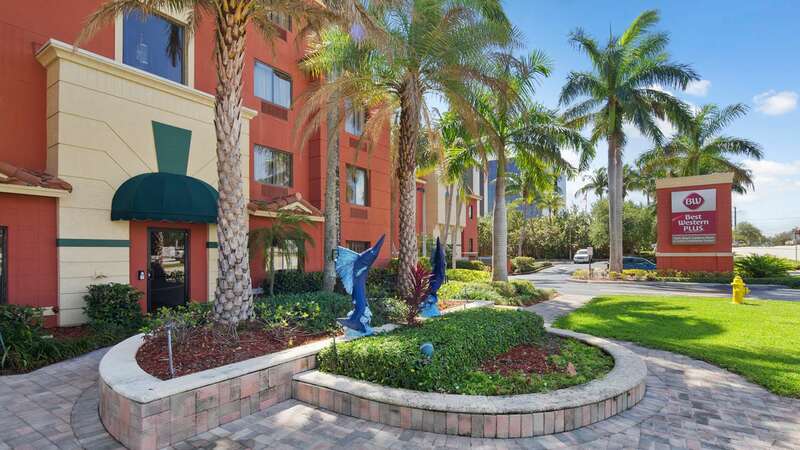 3 FREE PARKING GARAGES WITHIN WALKING DISTANCE! The Grand Classica - New Ship! Leaving the Port of Palm Beach and cruising to Freeport, Grand Bahama. Each person must make her/his own reservations. Call 800-281-9448 (9 AM - 3 PM Mon. - Sat.) to book your weekend cruise. Natalie or Tenzi will be happy to assist you. Mention Palm Beach Gator Snow Ski Club and group #1028 to receive group rate. $100 deposit per cabin required when booking. Full payment required 45 days prior to sailing by May 20th. Ocean View Cabins at $149 per person plus taxes, port fee & gratuity (approx. 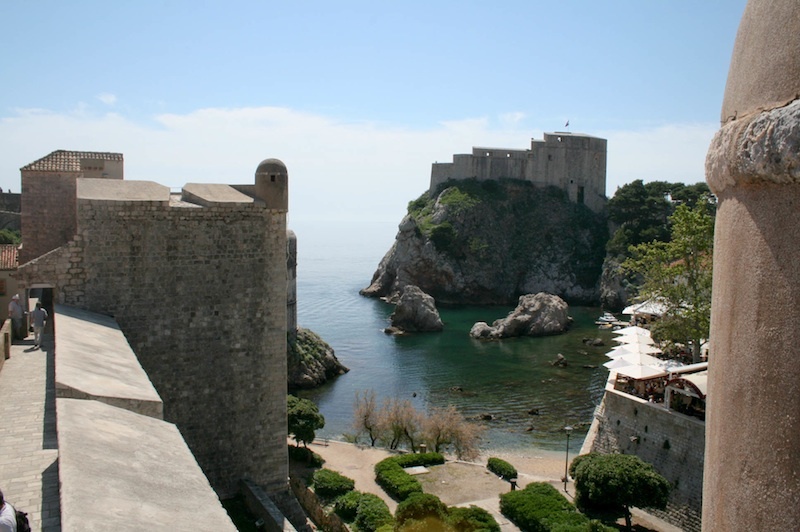 $116) for a total of $265 per person. Upper Deck Cabins available at good rates. Not included: On Board Charges & Parking. Upper Decks available at higher rates. Full payment required 45 days prior to sailing. - Date TBD: Meet for pre-party so we can discuss carpooling to save on parking fees. Lisa Mango lives nearby to Port of Palm Beach and another Gator is coming from Delray Beach. - Thursday, July 4th: Board as early as 11:30 a.m. be on board by 4:30 p.m., depart at 5:30 p.m. Come to Lisa Mango's cabin for champagne and to discuss dinner options. 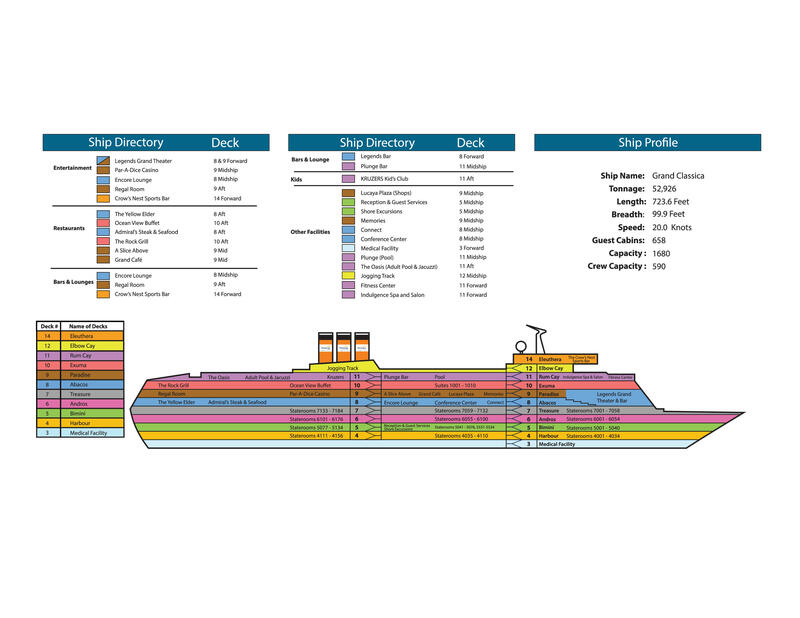 - Friday, July 5th: arrive at 8 a.m. at Grand Bahama Island and be back on ship by 4 p.m. to prepare for departure. At 6 p.m. come to Lisa Mango's cabin for champagne and to discuss going to a show together. For additional information, contact Lisa Mango at mangolm@yahoo.com, or 561-396-0361. With 10 glorious decks aboard the Grand Classica, you’ve got 10 chances to start a new adventure. The ship includes everything from spacious staterooms, grand ballrooms and theaters, to tons of dining venues and a sprawling Sun Deck, we have no doubts you’ll find something that piques your interest. The Grand Classica will be your world of adventure for two fun-filled days. Immerse yourself in our activity program where you’ll find live entertainment and performances, gameshows by the pool, casino events, and delicious food served at all times. Or kick back at your own pace and relax top deck to the sound of gently splashing waves. 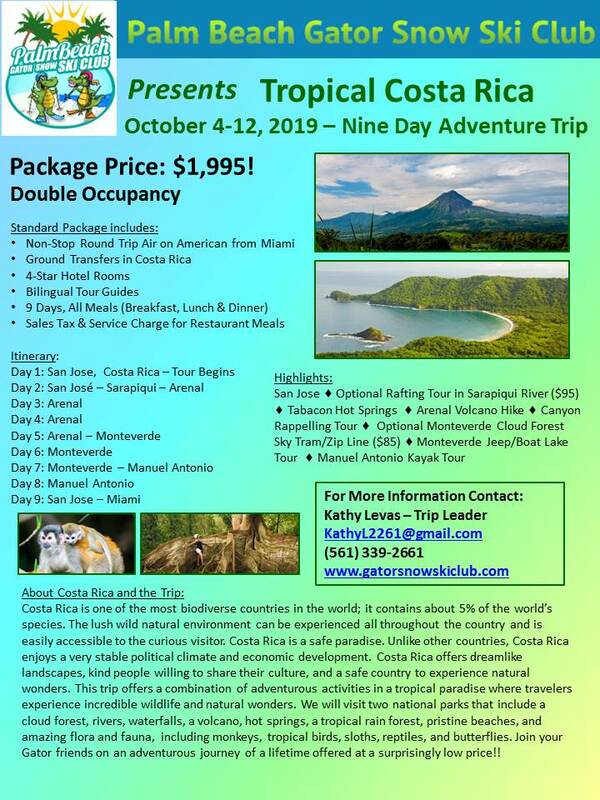 See the trip flyer below or download it for more information. Visit the perfectly preserved medieval walled city of Rothenburg Germany for two days. Then travel to beautiful Zell Am See in Austria for seven days and visit various scenic and historic areas nearby. 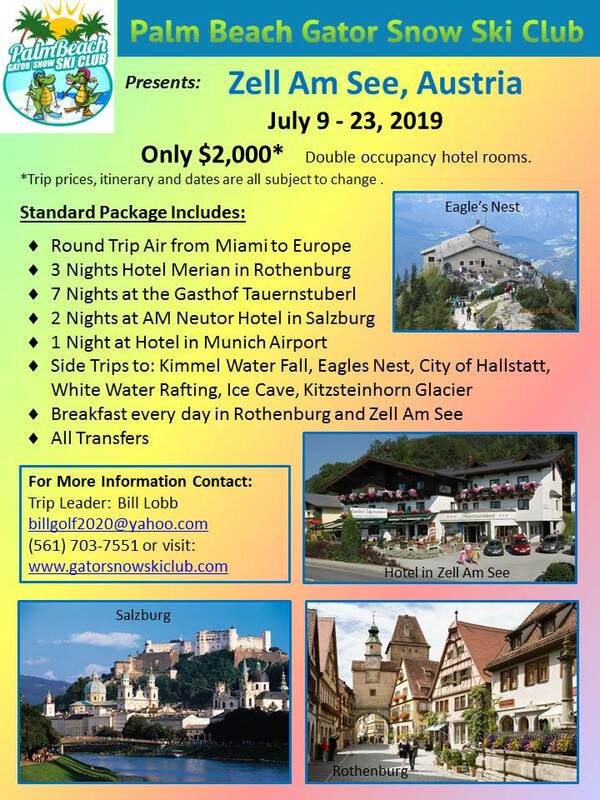 Next travel to Salzburg, Austria for a two day visit to this historic and gorgeous city, home of Mozart. Finally, spend a night in Munich Germany before your flight departs. * Per person/double occupancy. Price shown reflects a 3% cash discount when paying with cash or check. Prices and conditions are subject to change. Call 800-451-3483 and mention Palm Beach Gator Snow Ski Club to book at the group rate. Or click here to book your room on-line. Club Party Package: Only $50!!! It includes a Happy Hour on Friday Evening and the Sunset Cruise on Saturday Evening. Something FUN, FUN, FUN for Everyone!!! *Advertised price is per person/ based on double occupancy. Price shown reflects a 3% cash discount when paying with cash or check. Prices and conditions are subject to change. *Optional Tips for tour guides and local transportation are expected but not included in the base price. To become a member or renew, click here. Each member of a family must complete a separate reservation. * Optional Tips for tour guides and local transportation are expected but not included in the base price. 07 Jan 2017 Kravis: "Dirty Dancing, Musical"
13 Feb 2016 Kravis: "Motown, The Musical"
19 Jun 2014 General Membership Meeting- ONE WEEK LATER THAN USUAL! 22 Mar 2014 Leisure Bike Ride- "Tour of Wellington"